Still learning how to use MGLite & need help! I select items from basic list and they go into my cart. However, when I check them off as “purchased” at the store they do not seem to go back to basic list!? I find them in history but how do I get them back to basic list. Don’t want to reconstruct basic list after each shopping trip! Dotty, thanks for your question. Kindly note that you need to add items to your shopping list before you go shopping. I’d recommend using Favorites feature so that you could easily choose from the items that you buy often. In Favorites, if you long-tap any item and choose Select All, all your favorite items will be transferred to your shopping list. Or you may want to add items from History. 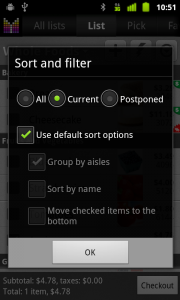 Under settings I have the aisles arranged as I want them, but then in the actual list, they are out of order. I’ve used this app for months with no problem, and this has only happened for the first time today. Any ideas? Hi Karen, thanks for your question. Unfortunately, it’s hard to guess the reason for the issue because the app should sort aisles in shopping list the same way it does in settings. May I ask you to create a backup and send your Account ID to hi@mightypocket.com so we could check our records? Thanks for your patience and sorry for any inconvenience. 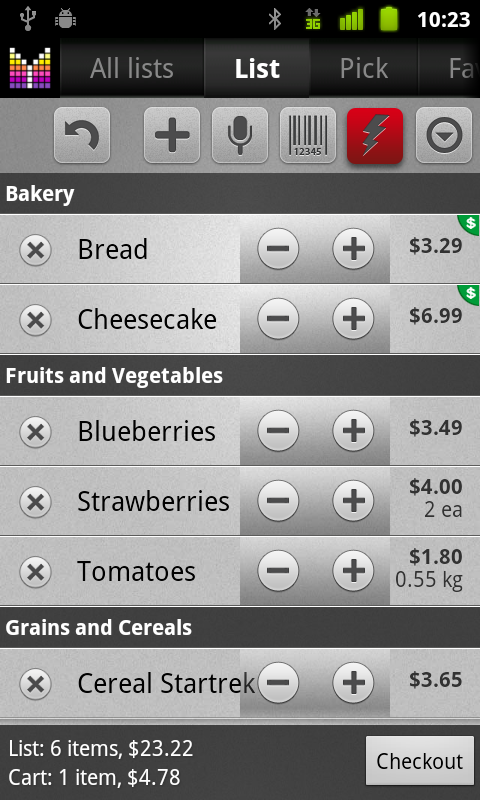 I´m starting to use this application and I´d like to obtain subtotals by categories for a checkouted list. I´d like to reenter this subtotals in a desktop expense manager application (MS Money in this case) in order to split a spent value. I see I could use the aisle as categories, but even I´d need a report summarized by aisle/category. Unfortunately, it is not possible to group expenses by categories in Mighty Grocery. However, we may consider adding this feature in the future. Is there a chance you will update numbers “page” so that the decimal point button is with numbers and I don’t have to get into “sym” page to enter decimal in price? Mike, thanks for your question. Kindly note that any non-digit symbol from numeric keypad may be used as decimal separator. Thank you Alex for your quick reply. I did not realize that would work. Can you update the app to allow for overages? Meaning, if you have an item that is on sale for $2. 00 and you put in a $3. 00 coupon it shows the total to be $0. 00 instead of the overage of -$1. 00. Thanks! Hi Chasity, thanks for your suggestion. 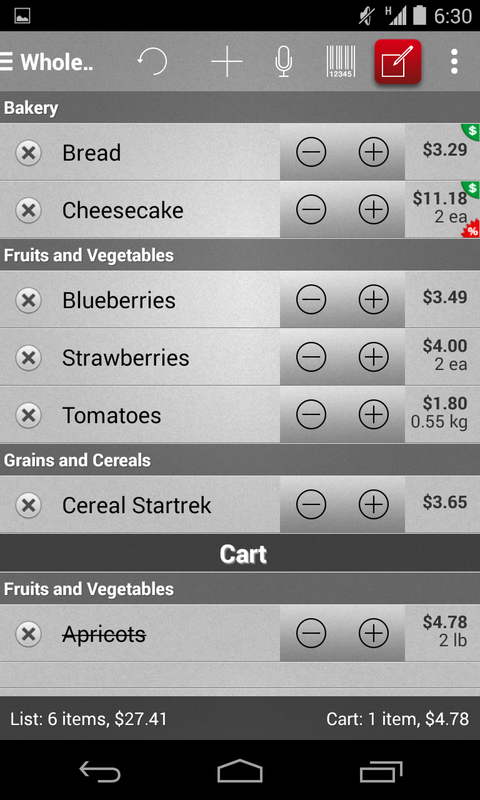 Kindly note that Mighty Grocery allows negative prices, but it won’t allow overage if coupon is more than actual item price which is expected behavior. Unfortunately, we will need more people interested in this feature to get it implemented. I am doing something wrong in adding items to my database, because when I want to find them again, to add them to the current shopping list, they are being found. When adding an item that I have scanned before, when I type the name, I would expect the add or search function to find this item and add it to the currently active list. I have items that both have been scanned and are in the favorite list – they are not being found. Only when I scan an item I have scanned before, does it get recognized. What do I have to do to have items found easily so that they will be found when typing in their name? make that “not found”, in the first sentence. Hi Kai, thanks for your question. 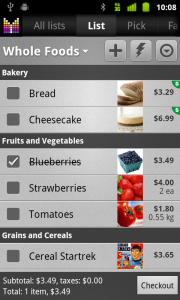 To create your database by scanning barcodes, I would recommend scanning items into My Picks: Menu –> Settings –> Pick list –> My Picks. All items listed under My Picks should be available when you add items in shopping list. Thanks for the feedback. My picks list is full of articles. I now know what the problem was. When using the search function you offer an autocompletion in the search field. This led me to believe that the same would be true for adding an items which is, basically just another search. 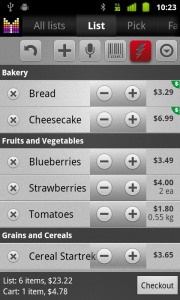 However, when adding an item to your shopping list there is a list of items visible below the search field. If I want to add an item that list is then filtered with each letter, showing me what could fit to what I am typing. However, if the item I wish to add is NOT on that list, the behavior is a different one. As I type the list below cannot be filtered, since the article is not listed on that list, and so I have to hope that my text entry corresponds to a given article and then add the article “blind”, so to speak. If I am lucky, there will be a hit and the right article is added. If there are more than one article with that string contained, the results seems unpredictable. I am hoping I have described the observerd behavior good enough. Whenever I type something in a text entry field for an article name, there should be suggestions visible from the entire database of articles that I have at my disposal. I’m sorry, I just figured it out, when I switch to the individual list for a store, it is then sorted by aisle! This app is awsome! As soon as I get a good handle on this, I am going to purchase the full version so I can share and coordinate the shopping list with family members. Kathy, I am glad you could resolve your question. Please feel free to contact us with any further questions. Thank you. I do have the aisles set up, but I use a master list as well as subs, but I would also like to use aisles also. I use the master list to initially assign an item, then move it to sublists depending upon sales. Perhaps I might need to switcc the master list off when shopping to have that better organized, then switch back afterwards. I am trying to learn how to use your app. Ihave entered my items and lists, but can’t figure out how to display aisle names on the list for shopping efficiently. Am I doing something wrong? Hi Kathy, thanks for your question. Please make sure that your items are assigned to appropriate aisle first. If you still don’t see aisle grouping, please see these suggestions to resolve the issue. This is a great app, but I’m wondering how to set another tax not the 13% that seems to be preset, thanks! Hi Michelle, thanks for your feedback and your question. Yes, you can change preset tax rates in Settings or individually for item.